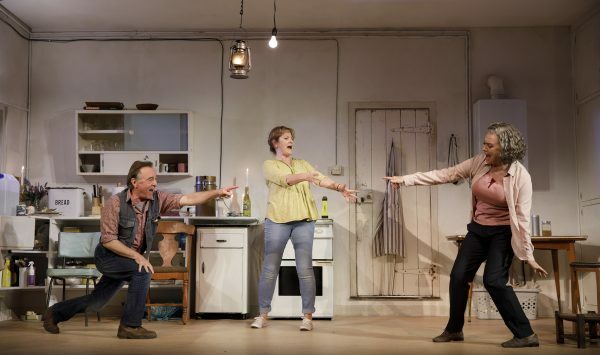 Even before its protagonists begin to drop casual allusions to “the disaster,” the piercing soundscape and tilted stage make it clear that something about Lucy Kirkwood’s play, The Children, is off. Director James Macdonald and production designer Miriam Buether present us with a domestic drama-style setting — a single room in a seaside cottage, to be precise — that is both figuratively and literally off-kilter at the outset. It hasn’t always been so, and the way each character responds to this unspoken shift under their feet in their tiny universe is telling. Hazel (Deborah Findlay), a nuclear engineer turned aggressively well-adjusted matriarch in her retirement, refuses to incorporate the change into her rigid routines and the peaceful existence she believes she’s earned — a peace that has been disrupted by the arrival of her former colleague Rose, played by an expressive and utterly arresting Francesca Annis. A few minutes into their unexpected reunion, Hazel places an apple on the table and seems not to notice as it rolls off; Rose takes it upon herself to clean up after Hazel’s determined obliviousness. Hazel’s charmingly cavalier husband Robin (Ron Cook), meanwhile, actively harnesses the upset, banking on the angle to accelerate as he careens around the stage on a tricycle. The work that brought the trio together nearly four decades ago also makes them complicit in the nuclear catastrophe that has devastated the country and caused Hazel and Robin to abandon their home, relegating them to a small cottage on the edge of the “exclusion zone.” That catastrophe has yet to be stopped, and seems likely to make short work of the young engineers rushing to contain it. This forced reflection on the mistakes of their youth — industrial and otherwise — sets the stage for a reckoning with the realities of ageing and the legacy we leave behind, both for our own children (as in the case of Robin and Hazel) and for “the children” writ large (a concern that weighs more heavily on the unmarried Rose). Kirkwood’s native England may not be teetering on the brink of environmental collapse the way the US increasingly seems to be, but its generational dynamics are similar, and it shows. Rose, Hazel and Robin, three white baby boomers now retired from a high-paying field, are the face of a demographic lately described as “grandparents stealing from the grandchildren.” Each processes this guilt and the sense of obligation that comes with it (or not) differently, and this becomes the central tension of their newly rekindled relationships. “Hazel was a socialist,” Rose says at one point, incredulous at her old friend’s now-distinctly self-interested self-care routines and defensive I’ve done my bit attitude. There’s humor and heart to be found in the script alongside its ethical quandaries, and Macdonald seizes on every moment of it. All three actors express their character’s nature and sensibilities through their physicality, aided by Macdonald’s precise choreography; in particular, Rose’s clumsy imitation (in dance, yoga, and life) of Hazel yields comedy and pathos by turns. Likewise, Kirkwood’s dialogue, which demands that its speakers overlap, interrupt, trail off, and visibly struggle in their attempts to articulate what they truly think and feel, makes each character refreshingly true to life. Which isn’t to say that these deliberate false starts lessen the play’s wit or coherence: it is wickedly funny and punctuated by both incisive commentary and emotional gut-punches all the same. As the facts of their lives are gradually exposed (and repeatedly reframed), audience opinions and loyalties necessarily shift, but each one’s view of what we owe to ourselves, each other, and the world is given a fair hearing. Despite some familiar dynamics, the play resists the traditional trajectory of the woman scorned or the best friend betrayed in favor of something simultaneously loftier and more human. Rose challenges her friends to make sacrifices so that a younger generation might have a future free from the apocalyptic burden gifted to them by their grandparents. Hazel lives cleanly in a bid to be there for her own kids long-term, tries not to waste energy, and convinces herself that this is enough until she brokenly reveals, “I don’t know how to want less.” What they want, what high-minded ideals they espouse, and what they ultimately do are often at cross-purposes. Whether Rose or Hazel’s approach is wholly noble, or needs to be, is largely left up to us. The play is, all told, admirably subtle — which makes the sensory overload of light and sound at its denouement an unfortunate anomaly in an otherwise understated production. When at its best (which is often), The Children offers an engaging, well-executed exploration of generational guilt and the messy interplay between the personal and political. In this era of creeping climate change and tax reforms that put the onus on the young to the benefit of the old, it’s a conversation that must be had — a masterful and timely meditation on what is required and what is right. The Children runs to February 4th, 2018 at the Samuel J. Friedman Theatre. More production info can be found here.